So i made this typography wallpaper style with Gokoudera and had fun with it. Description: I felt in love with the render and thought why not try making a wallpaper. So opened my Photoshop and started free-styling until i had an idea. So i started typing random letters on him (from head to toe). Then made the background and downloaded new fonts. Deleted the letters from his face and hands because it didn't look good. 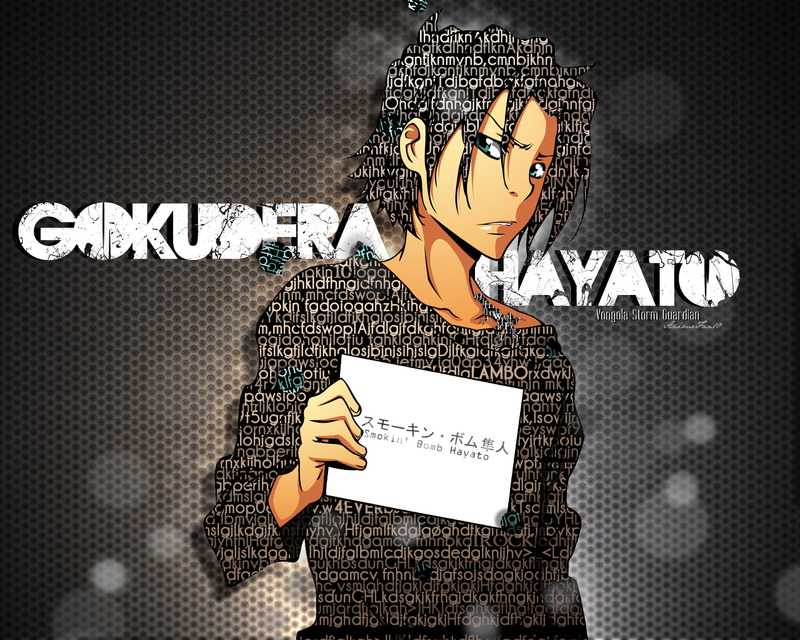 Final: I changed the whole font into my "own" (the Gokudera Hayato text) like erasing some parts with splatter brushes and did the final touch-ups on the whole wallpaper. Mm, it's not bad, but I would've liked to see actual text/phrases rather than just random letters. I think the random green/blue spots of text could probably go too, along with the two random spots with typography outside of Gokudera himself. Changed few things on it. Don't know how to change the wallpaper sizes yet without losing the quality =( (i'm so slow when it comes to that kid of stuffs). this is pure awesomeness...i can't stop looking at it haha.